In recent news, Final Fantasy XV has made headlines due to the explanation given about its all-male playable party. You may be thinking “why does an all-male playable party need explanation?” and you’d be correct, there doesn’t need to be an explanation and honestly, I wish we had never received one. Okay, so let me clear some things up here; there is nothing wrong with an all-male party. While I may fight for equality and more diversity in video games, it’s important to note that diversity doesn’t mean no men. Male stories are important too and considering the series, it makes sense to have some more male playable characters. The past three numbered Final Fantasy games have featured female playable characters and large cast of women in general. That being said, saying that an all-male party is “more approachable for players” is outrageous. Not only does that statement discredit female gamers, it also assumes that females are somehow unapproachable which discredits their own powerful female characters from past games (Lightning, Tifa, Yuna, etc.). It’s not supportive of male stories, it’s supportive of pushing women out of the way. Of course, this could be a poor choice of words but based on his further statements, I think it’s clear that it’s rather a poor choice of opinion on what players want and who they are. On top of that, Tabata continues by suggesting men are somehow different around women and that if a woman was present the whole game dynamic would be different. I get this on its face, heterosexual males may indeed act differently around heterosexual females and vise-versa due to attraction and whatnot. The problem is that these characters are obviously close friends, so if a female was present I would assume they would be friends with her too meaning she wouldn’t be someone they would be uncomfortable around or act differently around. I know it sounds wacky but men and women can indeed be friends with one another without any romantic or sexual feelings present. Also, this isn’t a spontaneous real-life event – it’s a video game. It’s written to be the way it is, therefore a female character could easily be written in as just “one of the guys” (I hate that phrase, but it fits here). Not that I want that to happen per-se, but it’s weird to act like this isn’t a video game being created by imaginative individuals – it could have worked if they wanted it to. Again, this is problematic. The beginning of this statement implies that again, women are weird to be around and thus don’t belong around the men of this game. What boys do when girls aren’t around? What is this, the “no girls allowed” tree house club? It’s pointless to have said any of this at all considering the second half of this particular statement says that regardless of gender, we will all feel a bond with these characters. I believe this to be true, I know that Final Fantasy games are generally well-written and feature relatable characters, so why bother with these other odd statements? It seems so unnecessary to unintentionally ruffle feathers over this issue when the game is supposedly going to speak for itself when it comes to the characters and their connection with one another and the player. Here’s the thing that upsets me most about all of this. It’s not just that we received an unnecessary explanation or that what Tamata said was ridiculous, it’s that this is a symptom of a larger cultural issue with the way women and men are perceived in the media. It’s blatantly obvious through media outlets and explanations such as these that the general population sees men and women as inherently different. We see this mindset often via “chick flicks” consistently stereotyping women and “bro flicks” stereotyping men. It’s not that no woman has ever been involved in a “How to Loose a Guy in Ten Days” situation or no male has ever been in a “The Hangover” type scenario, for example, but when these types of movies/games/shows/songs are constantly made showcasing the same types of behaviors as “normal” for men or women it creates and perpetuates harmful stereotypes such as women are crazy and nosey or that men are allowed to cheat on their wives if the mistress is attractive. These are just a few examples, but you should get the gist. The point is that the notion that men and women are inherently different leads to segregation, sexism and harmful stereotypes that hurt all genders. Of course men and women are different biologically and that is something that cannot be argued, but otherwise men and women are really not different at all. Humans are who they are based on personality traits, actions, relationships, etc. – not gender. This idea that they are too different to be in the same spaces in the same ways insinuates that, for example, stories about women have to be about menstruating and putting on make-up while stories about men have to be about hooking up with women and eating lots of steak. Not only does this mindset continue to perpetuate the idea that men and women are so different that they cannot occupy the same spaces without issues, it also ignores other genders and supports the gender binary – another problematic issue. I recently read an op-ed written in regards to this specific issue which combats the notion of “bioessentialist ludology”, as the author calls it, which is essentially the notion that men and women cannot enjoy the same things (as he relates it to purchasing games, I relate it to literally being in a group together). It’s a great read and really digs deep into this cultural implication that men and women are different in all ways, and of course that women are somehow the lesser gender (which these ideals always seem to lead to, sadly). I am aware that this game will most likely not be overtly and stereotypically “masculine” in that these men will be “hooking up with women and eating lots of steak”, but by implying that adding a woman to this party would change the whole games dynamic it perpetuates the aforementioned issue of these genders being so different that they cannot occupy the same party. I doubt that this game will be purposefully offensive to women either but that doesn’t excuse this unnecessary explanation which makes it seem as if the game’s creators believe in this bioessentialist notion, which is troubling. I’m not trying to argue that this game, or any game for that matter, should have women forced in just for the sake of diversity. Forcing a woman (or a person of any gender, for that matter) into a video game without the proper context makes for an awkward experience. We as players can feel when a character was pointlessly added for whatever reason, so if the story doesn’t call for a certain character then there is no need to shove one in for the sake of diversity. I’d rather see games made for diverse characters instead. What I am arguing here is that sometimes it’s okay to just not say anything. This explanation was not only pointless, it was angering and full of underlying cultural issues. 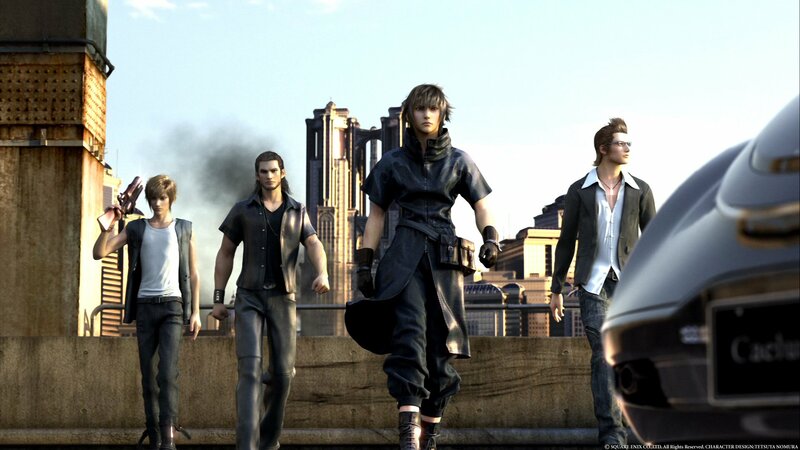 I had, and still have, no issues with Final Fantasy XV’s all-male party. Until this interview, I had never even thought twice about it but now it’s bothering me for all the wrong reasons – not because the game will be bad or offensive, but because the mindset behind the all-male party is so ludicrous. Final Fantasy is not a series which has been particularly oppressive to female characters, in fact on the contrary the series arguable hosts some of the most powerful, well-written female characters in video games. Statements like these simply draw attention to a problem that shouldn’t exist. There shouldn’t need to be some kind of “male players are more approachable and these bros are such bros that a woman would ruin everything” reasoning behind this cast of characters. Yet, now people are talking about it and not in a good way, so where did this kind of statement get this game? In articles like this in which people express their level of upset at this particular explanation – because it’s ridiculous. I hope that other developers learn from this and know that for situations like this, let the game speak for itself. I’m sure that when playing this game it will be well-written enough to convey the closeness of these men, the “male bonding” if you will, to the player without ever needing such explanations. Let the players relate to your characters on their own, it isn’t that a specific gender is “more approachable”, it’s that well-written characters are better received and that is what should matter most. This helped a lot. You addressed all of my concerns and counter-arguments while giving an altogether fair argument against these quotes. Good read! This is the most perfect argument about the issue I have ever heard all day. That comment bothered me so much to the point I wasn’t even sure to buy the game. What upsets me is when kids are children both boys and girls they don’t think about gender. They all just act like friends and do everything together. When they grow up and with all these media’s and unwritten rules about gender, they separate and end their friendship bc they believe men and women can’t be friends bc of sexuality and attraction. That just breaks my heart. Sad thing is I have friends that are male and fear we might end our friendship bc of these. I’m so happy you talked about all my concerns and reasons bc you were spot on. Thank you! And I agree with you as well, it’s sad that as we grow older society has all these guidelines about how men and women should interact when really we should all be able to do what we want, with whomever we want because gender doesn’t matter. I hate seeing gender separation in games like this because it makes no sense and further separates us all.